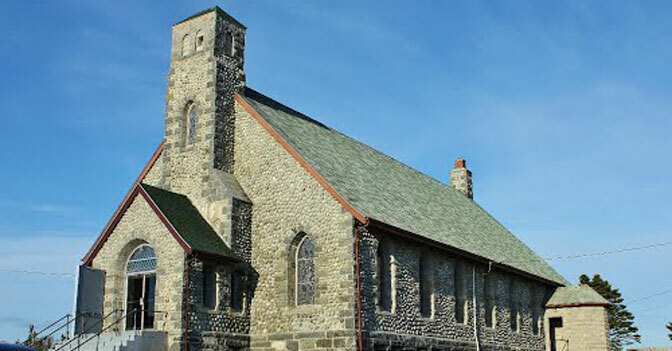 The Stone Church was first started on September 5, 1921, by Lieutenant-Governor Grant. The foundation is made of native granite and three feet in thickness. The granite that was used was all cut by hand using chisels. The walls are made of cobble stones gathered from the shore and surrounding islands. This church is 85' by 55' and has a seating capacity of five hundred. The inside of the church is decorated in rich wood and is very beautiful. The woodwork covering the walls is fitted with tongue and groove. All of the windows were stained glass and were brought from Toronto in 1927. These beautiful windows were all inscribed as memorials by families or individuals at a considerable amount of money for that time. Mr. Thomas Doucette was given the task of constructing the Stone Church from blueprints which were designed by a Halifax architect named S. P. Dumaresq. Thomas Doucette began building the church, even though he could not read or write, and had the blueprints read to him only once. It took ten years to totally complete the church.